When the topic of a bathroom remodeling project is brought up, the usual assumption is the replacement of older fixtures and amenities with newer versions and perhaps the installation of some new tiles or coat of paint. Yet there are figuratively thousands of great bathroom remodeling ideas that are a little off the traditional path and of an upscale nature. The homeowner of today has an almost bewildering array of choices when it comes to refurbishing their “throne room” into a welcome retreat from the stresses of the everyday world. All About Bathrooms offers some great bathroom remodeling ideas that can really spruce up one’s home. Gone are the days when the hardest decision that the homeowner had to make when considering a bathroom remodel was how many white tiles should be used in conjunction with black tiles. The sky is now the limit when it comes to redoing one’s bathroom, and the tiles of today are one of the great bathroom remodeling ideas that the design experts at All About Bathrooms can offer. Individuals can now go fully upscale when choosing tiles in lieu of the old white subway tiles of yesteryear. Tiles are now available in marble, granite, bamboo, slate, and many more styles. Hand-painted tiles from Mediterranean countries can be used to bring the sun-drenched atmosphere of that region to the mountainous heights of Colorado. Bamboo and other wood tiles can be used to evoke the jungle mood of the rain forest. Other interesting tile selections include embossed or three-dimensional tiles. For the ultimate in bathroom comfort on those cold winter mornings, a heated floor tile system can be installed to keep one’s toes toasty warm on the trip from the bed to the bathtub. Another feature of the bathroom that can serve as a great bathroom remodeling idea to help spruce up one’s home is the shower. The remodeling experts at All About Bathrooms can attest that the luxury showers of today are a far cry from the old household standard. Modern showers can feature multiple outlet options, such as a fixed overhead showerhead and a handheld one. The ultimate in pampering is to install a shower with body jets that will make the homeowner feel like that they’re in a high-end spa. Of course, if one truly wishes to feel like they’re bathing outdoors in the gentle rain, they can opt for a shower with a rainshower or waterfall outlet. A great feature found in upscale showers is the anti-scald feature that ensures that one does not accidentally burn oneself. Many new luxury showers can also feature a shower seat to sit upon while bathing and even a lighted alcove. A big trend in showers currently is the no-threshold shower, which allows an individual to walk directly into their shower without having to step up and over. Not only does a no-threshold shower make the bathroom look bigger, they also are great for homeowners who are getting older and where mobility is becoming an issue. If one really wishes to really splurge and take their bathroom remodel to the next level, they can purchase a shower that is controlled by an app. A person could start up the shower and get it up to the desired temperature while still staying warmly snuggled in their bed. 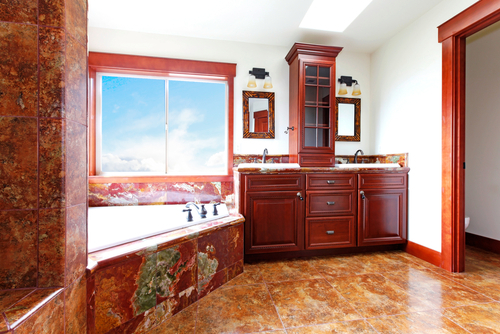 Warmth is a definite comfort feature for a great bathroom remodeling project. Besides a floor tile heating system and an app-controlled shower, there are other ways that the homeowner can stay nice and warm in their bathroom no matter how frigidly cold it is outside. Towel warmers can be installed to ensure that a person can dry off with a toasty warm towel. Radiators and bathroom heaters have been greatly upscaled over the last few years. There are radiators that are built to resemble Asian-style dividing screens to add a touch of elegance to the bathroom. Not to be outdone, there are flat panel bathroom heaters that also function as a beautiful piece of contemporary art. Quite a few of the upscale towel warmers also boast a self-closing timer setting after running at full power for a specific length of time. Overall, there are lots of options that not only keep one’s bathroom warm but can also double as a work of art. The central feature of any bathroom is the toilet, which serves as another inspiration for some great bathroom remodeling ideas. The humble “throne” has now evolved into many different styles for the homeowner to choose from. A popular choice today is the elderly toilet, which is essentially a toilet that features a higher pedestal height for extra ease in sitting down and getting up. Such a design is only the tip of the iceberg as All About Bathrooms can suggest quite a few smart toilets that take “taking care of business” to a whole new level. Such toilets can feature an electronic seat cover that can automatically open or close, not to mention a seat warmer to keep one’s backside nice and toasty. Other features that can be found on smart toilets include a warm-water bidet, automatic flushing, temperature control, and multiple cleansing settings. There are even toilets that have a separate siphon for male urination and multiple flush settings depending upon whether the user did number one or number two. Another great bathroom remodeling idea that really raises the bar for the home is adding media and music to the bathroom. A homeowner can have wireless speakers, docking stations, and Bluetooth devices installed in many different areas of the bathroom, including the mirrors, vanities, and even the shower. There are now showerheads that actually feature a waterproof speaker so that an individual can sing along to their favorite tunes while bathing. Not to be outdone, TVs can be mounted on a bathroom wall or even in a shower. Women can enjoy a nice romantic comedy while soaking in the tub and sipping some wine. The design experts at All About Bathrooms know that there are a lot of great bathroom remodeling ideas that don’t follow the standard route. If one is willing to spend a bit more, the amount of luxury that can be incorporated into the bathroom is staggering. Heated floors, remote-controlled showers, imported exotic tiles, wireless electronics, and smart toilets are all possible amenities that can turn a boring bathroom into an amazing spot for rest and relaxation.